Fleck performing on February 9, 2007. 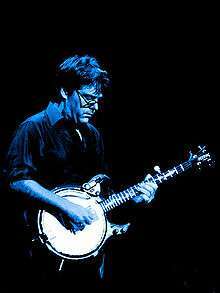 Béla Anton Leoš Fleck (born July 10, 1958) is an American banjo player. Widely acknowledged as one of the world's most innovative and technically proficient banjo players, he is best known for his work with the bands New Grass Revival and Béla Fleck and the Flecktones. 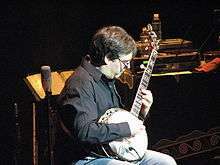 Béla Fleck was born in New York City, and is named after Hungarian composer Béla Bartók, Austrian composer Anton Webern and Czech composer Leoš Janáček. He was raised by his mother, a former school teacher, and claims he did not meet his father until he was in his 40s. He was drawn to the banjo when he first heard Earl Scruggs play the theme song for the television show Beverly Hillbillies. He received his first banjo at age fifteen from his grandfather in 1973. Later, Fleck enrolled in New York City's The High School of Music & Art where he studied the French horn. He was a banjo student under Tony Trischka. Shortly after high school, Fleck traveled to Boston to play with Jack Tottle, Pat Enright, and Mark Schatz in the group Tasty Licks. During this period, Fleck released his first solo album in 1979, Crossing the Tracks, and made his first foray into progressive bluegrass composition. Fleck played on the streets of Boston with bassist Mark Schatz. Along with guitarist/vocalist Glen Lawson and mandolin great Jimmy Gaudreau, they formed Spectrum in 1981. Fleck toured with Spectrum during 1981. That same year, Sam Bush asked Fleck to join New Grass Revival. Fleck performed with New Grass Revival for nine years. During this time, in 1987 Fleck recorded another solo album, Drive, which was nominated for a Grammy Award in 1988 in the new category of "Best Bluegrass Album". During the 1980s Fleck and Bush also performed live occasionally with Doc Watson and Merle Watson in various bluegrass festivals, most notably the annual Telluride Bluegrass Festival. Fleck (right) with Victor Wooten. Béla Fleck and Victor Wooten formed Béla Fleck and the Flecktones in 1988, along with keyboardist and harmonica player Howard Levy and Wooten's percussionist brother Roy "Future Man" Wooten, who played synthesizer-based percussion. They recorded numerous albums, most notably Flight of the Cosmic Hippo, their second album, which reached number one on the Billboard Top Contemporary Jazz Albums chart, and found increased popularity among jazz/rock/fusion fans. Levy left the group in 1992, making the band a trio until saxophonist Jeff Coffin joined the group onstage in 1997. His first studio recording with the band was their 1998 album Left of Cool. Coffin left the group in 2008 to replace Dave Matthews Band's saxophonist, LeRoi Moore, who had just passed away. Howard Levy rejoined the Flecktones in 2009. Béla Fleck and the original Flecktones went on to record Rocket Science, and tour in 2011. With the Flecktones, Fleck has been nominated for and won several Grammy awards. Fleck has shared Grammy wins with Asleep at the Wheel, Alison Brown, and Edgar Meyer. He has been nominated in more categories than any other musician, namely country, pop, jazz, bluegrass, classical, folk, spoken word, composition, and arranging. In 2001, Fleck collaborated with long-time friend and playing-partner Edgar Meyer to record Perpetual Motion, an album of classical material played on the banjo along with an assortment of accompanists, including John Williams, Evelyn Glennie, Joshua Bell and Gary Hoffman. The album includes selections such as Chopin's Etude Op. 10 No. 4 in C# minor, Debussy's Doctor Gradus ad Parnassum, and Paganini's Moto perpetuo (from which is derived the name), as well as more lyrical pieces such as the first movement of Beethoven's Moonlight Sonata, two of Chopin's mazurkas, and two Scarlatti keyboard sonatas. Perpetual Motion won two Grammys at the Grammy Awards of 2002 for Best Classical Crossover Album and Best Arrangement for Fleck and Meyer's arrangement of Doctor Gradus ad Parnassum. Fleck and Meyer have also composed a double concerto for banjo and bass, and performed its debut with the Nashville Symphony Orchestra. Fleck and Meyer were later commissioned to compose a trio concerto, for which they teamed up with Indian tabla player Zakir Hussain. The concerto debuted in Nashville in 2006 and was later recorded for the album The Melody of Rhythm. The trio subsequently toured together in 2009 and 2010. Fleck named Chick Corea, Charlie Parker, and the aforementioned Earl Scruggs as influences. He regarded Scruggs as "certainly the best" banjo player of the three-finger style. Solo and with the Flecktones, Fleck has appeared at High Sierra Music Festival, Telluride Bluegrass Festival, Merlefest, Montreal International Jazz Festival, Toronto Jazz Festival, Newport Folk Festival, Delfest, Austin City Limits Music Festival, Shakori Hills, Bonnaroo, and Jazzfest, among others. He has appeared as a sideman with artists including Tony Rice, Dave Matthews Band, Ginger Baker and Phish. An appearance with the Dave Matthews Band, along with the rest of the Flecktones, resulted in the longest singular live song in DMB history, "#41", at 32:03 in length. Fleck played banjo on three tracks on Dave Matthews Band's 1998 album Before These Crowded Streets, including the album's debut single "Don't Drink the Water". In 2005, while the Flecktones were on hiatus, Fleck undertook several new projects: recording with African traditional musicians; cowriting a documentary film called Bring it Home about the Flecktones' first year off in 17 years and their reunion after that time; coproducing Song of the Traveling Daughter, the debut album by Abigail Washburn; forming the acoustic fusion supergroup Trio! with fellows Jean-Luc Ponty and Stanley Clarke, and recording an album as a member of the Sparrow Quartet (along with Washburn, Ben Sollee, and Casey Driessen). In late 2006, Fleck teamed up with Chick Corea to record an album, The Enchantment, released in May 2007. Fleck and Corea toured together throughout 2007. In July 2007 at the Winnipeg Folk Festival, he appeared and jammed with Toumani Diabaté, a kora player from Mali. Fleck has also played with Malian ngoni player Cheick Hamala Diabate. In December 2007, he performed charity concerts in Germany to help promote AIDS awareness. His largest concert was held in Grosse Halle Bern, Switzerland on December 1, 2007. In 2007, while touring the United States, the Tuvan throat-singing group Alash Ensemble recorded three tracks with Bela Fleck and the Flecktones for the Christmas album Jingle All the Way. Later in December 2008 and December 2009 Alash toured with the Flecktones to promote the album, which won the 2009 Grammy Award for Best Pop Instrumental Album. On June 13, 2008, he performed as part of The Bluegrass Allstars, composed of bluegrass heavyweights Sam Bush, Luke Bulla, Edgar Meyer, Bryan Sutton, and Jerry Douglas at the Bonnaroo Music and Arts Festival in Manchester, Tennessee. The next day Fleck performed with Abigail Washburn and the Sparrow Quartet at the same festival. In 2009, an independent film documentary of Fleck's visit to Uganda, Tanzania, The Gambia, and Mali, was released to limited run engagements in US cities. Throw Down Your Heart was directed by Sascha Paladino, Fleck's half brother. It was filmed during Fleck's year off from touring with the Flecktones. He was scheduled to play the 2009 Bonnaroo Music and Arts Festival with Toumani Diabaté. Fleck premiered his Concerto for Banjo in Nashville, Tennessee on September 22, 2011, performing with the Nashville Symphony Orchestra, which commissioned the work. Fleck was Joanie Bartels' banjo player. Fleck is married to banjo player Abigail Washburn. Washburn first met Fleck in Nashville at a square dance at which she was dancing and he was playing. Fleck produced Washburn's first solo album. Fleck brought Washburn to Sascha Paladino's wedding in August 2007, and they played in a scratch band composed of wedding party members. In May 2009, the Bluegrass Intelligencer website satirized the upcoming "strategic marriage" of Washburn and Fleck, with Driessen joking that the couple promised a "male heir" who will be the "Holy Banjo Emperor". They had a son in 2013. Béla was featured on such television shows such as Late Show with David Letterman, Late Night with Jimmy Fallon, Late Night with Conan O'Brien, Saturday Night Live, Later with Jools Holland, Sesame Street, Austin City Limits, The Tonight Show with Jay Leno, Music City Tonight and The Marty Stuart Show. Also Sunday Morning on CBS in March 2015. Béla was featured on the July/August 2013 cover of Making Music Magazine to discuss his life and career. Béla Fleck has been nominated in more categories than any other musician in Grammy history. 1 2 Watts, Cindy (May 22, 2013). "Bela Fleck, Abigail Washburn welcome baby boy". The Tennessean. Gannett. Retrieved May 23, 2013. ↑ "Béla Fleck". Contemporary Musicians. 47. Detroit: Gale. 2004. Gale Document Number: GALE|K1608004009. Retrieved March 12, 2015. Biography in Context. ↑ "Bela Fleck". Rhapsody. Retrieved August 8, 2013. 1 2 "Béla Fleck + Abigail Washburn - Beauty in Banjo and in Life". On Being with Krista Tippett. 2 July 2015. Retrieved September 3, 2015. 1 2 "American Roots Music : Oral Histories – Bela Fleck". PBS. Retrieved 2013-08-08. ↑ Torkington, Nathan (April 21, 1996). "Interview with Bela". Front Range Internet, Inc. (FRII). Archived from the original on February 21, 1999. ↑ "Dave Matthews Band - #41 (with Béla Fleck)". YouTube. 7 May 2011. Retrieved 16 November 2016. ↑ Decurtis, Anthony. "Before These Crowded Streets". April 16, 1998. Retrieved December 2, 2014. ↑ Levine, Doug (April 24, 2007). "Chick Corea, Bela Fleck Collaborate on New CD". VOA News. Voice of America. Retrieved January 1, 2009. ↑ "Alash To Tour With The Flecktones". Fotuva.org. 2009-11-08. Retrieved 2016-04-23. ↑ Oksenhorn, Stewart (February 4, 2010). "Banjoist Béla Fleck brings his Africa Project to Aspen". The Aspen Times. Swift Communications. Retrieved December 10, 2010. A year ago, Fleck appeared in Aspen as a member of the Sparrow Quartet, an ensemble led by fellow banjoist (and Fleck's girlfriend at the time, now his wife) Abigail Washburn that mixed Chinese folk songs, Appalachian gospel tunes, blues and more. ↑ Laskowski, Christine (July 8, 2010). "American Roots & a Love for China: Abigail Washburn Returns". Blog. The Beijinger. Retrieved December 10, 2010. ↑ Stowe, Stacey (August 5, 2007). "Erin Torneo and Sascha Paladino". The New York Times. Retrieved December 10, 2010. The band, consisting of the bridegroom's half brothers, Louie Fleck and Béla Fleck; the bridegroom's father, Joe Paladino; and Abigail Washburn, Béla Fleck's girlfriend, performed "Two of Us" by the Beatles. ↑ "Strategic Marriage Will Consolidate Power Within Single Banjo Sovereignty: Fleck, Washburn promise male heir, Holy Banjo Emperor". Bluegrass Intelligencer. Nashville: bluegrassintelligencer.com. May 28, 2009. Retrieved December 10, 2010. ↑ "Béla Fleck Brings Banjo from Front Porch to World Stage". July 1, 2013. Retrieved September 11, 2014. ↑ "Awards : Grammy Awards and Nominations". Mywebpages.comcast.net. Archived from the original on August 18, 2007. Retrieved 2013-08-08. ↑ "GRAMMY.com". February 8, 2009. Archived from the original on February 13, 2009. Gray, Michael (1998). "Béla Fleck". In The Encyclopedia of Country Music. Paul Kingsbury, Editor. New York: Oxford University Press. pp. 174–5. Wikimedia Commons has media related to Béla Fleck.